The work on view on the CAPC’s façade at the southwest corner is made up of four series of words written in neon letters. 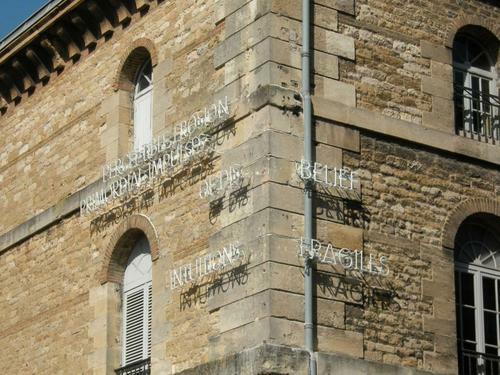 These pairs of word are associated in twos, a noun and an adjective, in two languages, French and English, on lines which overlap and are extended after the corner of the building, with the corner creating a possible and additional caesura in the reading. So you cannot help but read this sort of suggestive haiku all at once, not in any particular order : PERCEPTIBLE EROSION, PRIMORDIAL IMPULSES, OF DISBELIEF, INTUITIONS FRAGILES… The neon words light up turn by turn at nightfall, based on a pre-established programme which is random and complex. The choice of upper case lettering seems intent on rivalling signs. 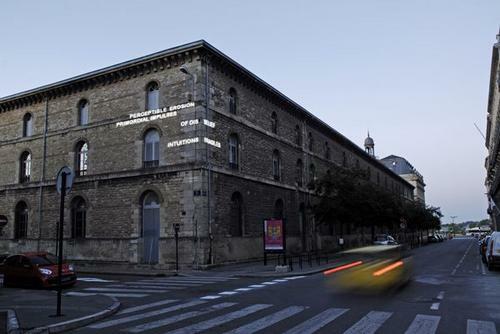 In any event the work can be connected to certain conceptual pieces from the 1970s, in which these two “materials”, neon and language, were typical. But if the process-based dimension, commonly used by the artist, confirms this lineage, it is the tangible fragility of the message and the subtlety of the attention it calls for that we remember from this vertical manifestation. Vittorio Santoro was born in 1962 in Zurich. He lives and works in Berlin and Zurich. This work was acquired and installed thanks to the patronage of the DV Construction company.